GourmetGiftBaskets.com is a company that I have used and trusted for a few years now. I know that whatever I order from them will always be of good quality and be a great value as well. I was given the opportunity to review an Easter basket from GourmetGiftBaskets.com, and I was very excited to do so! · Cinnamon & Brown Sugar Popcorn by KingOfPOP.com - 1.4 oz. - Crisp and sweet gourmet popcorn that's dusted with freshly ground cinnamon and brown sugar. · Chocolate Wafer Petites by Dolcetto - .7 oz. - Thin and crisp pillow-shaped cookies that warp around centers of exquisitely smooth chocolate. · Chichester Trail Mix by Merrimack Valley Snack Company - 2 oz. - An irresistibly crunchy trail mix composed of premium nuts, cheddar cheese crackers, and salted pretzels. · Milk Chocolate Smothered Graham by Asher's - 1.01 oz. - A thin graham cracker that's smothered in a thick layer of smooth milk chocolate. · Dark Chocolate Smothered Graham by Asher's - 1.02 oz. - A classic cinnamon-dusted graham cracker that's drenched in rich dark chocolate. · Peeps by Just Born - Assorted Colors - Smooth, creamy marshmallows that are pressed into adorable, festive shapes and coated with bright, cheery confection. · Toasted Coconut Moravian Cookies by Salem Baking - 5 oz. - Ultrathin Moravian cookies that get their exotic flavor from real coconut. · Gummi Peach Rings by GourmetGiftBaskets.com - 8 oz. - Chewy gummy rings that explode with sweet peach flavor. · Chocolate Wafer Rolls by Fusion Gourmet - 3 oz. - Delicate European-style wafers that are rolled into cylinders and filled with creamy chocolate. · Jelly Beans by Buttercup Candy Shoppe - 3.5 oz. - Over-sized jelly beans that offer sweet fruit flavors created using the finest ingredients. · Holland Mints by Marich - 2.1 oz. - Creamy peppermint centers that are cloaked in rich chocolate. Yep, aalllll of that inside one pretty basket! Hard to believe that is only $59.99, right? This year GourmetGiftBaskets.com is offering a special new treat: A 12-inch Easter Cookie Cake! The Cookie Cake comes in two options - one with a baby bunny on it, and the other with a flower. You can find these right now at GourmetGiftBaskets.com for just $34.99! 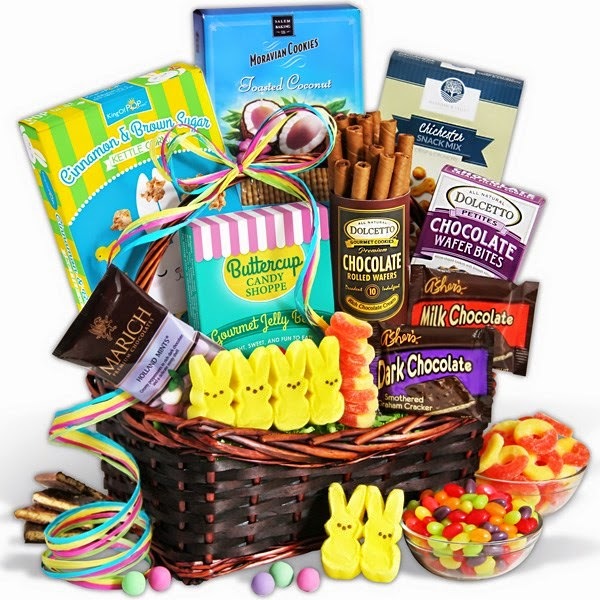 Be sure to visit GourmetGiftBaskets.com to find the perfect basket for your loved ones! They make a great gift for anyone and everyone on your list!